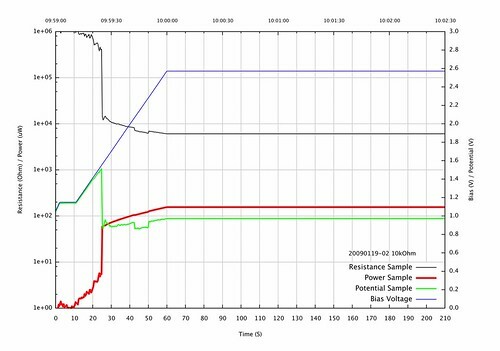 By measuring the best known variables, applied bias voltage U, electric current I and the known series resistor with resistance Rs. The unknown variables of the sample, potential drop Up, sample resistance Rs, power in sample Pp was calculated with lesser noise. I have remade the plots with this new approach and it clearly shows much better noise-ratio than before. The calulations before were made by using the noisy-value of the measured potential drop over sample. The sintering image folder at flicker shows you the other plots that were remade.